In the summers, we love having a vegetable garden. I love being able to go out to the backyard and come in with an armload of fresh tomatoes, green beans for dinner, and plenty of squash or snap peas. One thing we grow a lot of is zucchini. Should you happen to stop by my house on any given day during the summer months, it’s likely that you’ll find some type of baked good with zucchini in it, sitting on my counter. (What can I say? 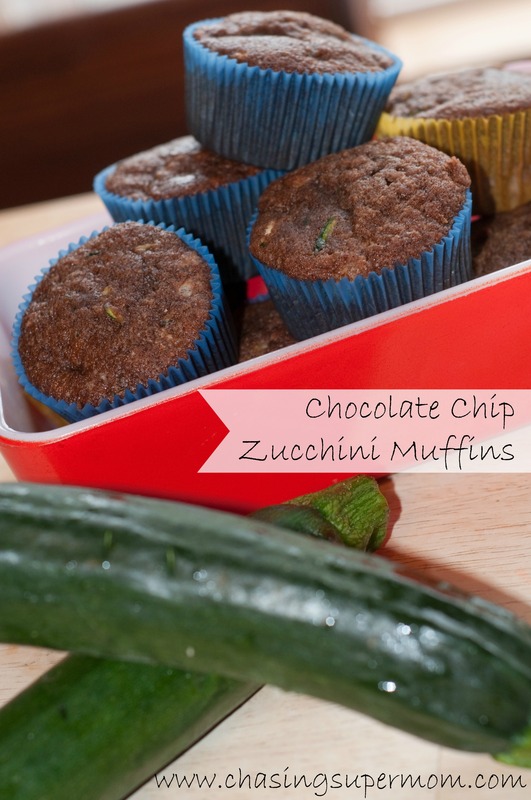 I love to bake and I LOVE zucchini!) While I do make a great Healthy Zucchini Bread, my hands-down favorite thing to make with zucchini are these muffins. They’re seriously like eating chocolate cake. (*Sometimes I actually pour the batter into a 13×9 pan instead of doing muffins!) I think they taste a lot like a chocolate Costco muffin. They’re divine – and no one would ever guess they had zucchini inside. These are easy to make, are made with things you likely have on hand (especially if you like to bake), and are a delicious way to get non-veggie eaters to eat squash! Enjoy! 2. Cream together the butter, oil, and sugar. Add in the eggs, milk, and vanilla and mix well. 3. Stir in flour, cocoa powder, baking soda, and salt. Mix. Stir in zucchini. 5. Line your muffin pans with muffin papers or spray with non-stick cooking spray. Fill the muffin cups 1/2 -3/4 full. 6. Bake for approximately 15-20 minutes (*depending on your oven – keep a watchful eye! ), or until a toothpick inserted in the middle comes out clean. *This recipe makes 24 standard sized muffins or one 13×9 cake. These are a favorite for breakfast around our house. I hope your family will enjoy these muffins as much as we do! Happy baking! One can’t have too many zucchini recipes for the summer overabundance. Looks yummy. These are so yummy! Last summer I used this as an easy and healthy go-to breakfast on those mornings when I just didn’t feel like making breakfast. I added a bit of ground flaxseed, blueberries, and subsituted about a third of the regular flour with soy flour (for protein). About to go make some, as all of are blueberries are ripening!